Led panel in a project to realize a very bright and internet ready digital signage useful for a wide range of applications like message notifications, alarms, synchronized clock, scrolling text, etc. 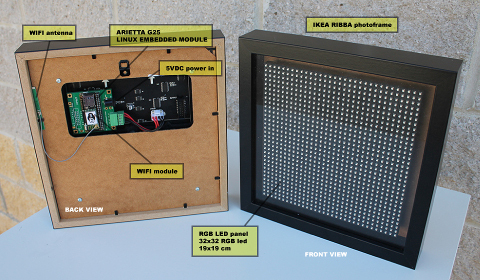 The project is open and based on the tiny Linux board Arietta G25 wired to a 32x32 RGB led panel and interacts with the user smartphone via a WiFi link. As shown below all the electronic parts can be fixed inside a cheap and elegant IKEA RIBBA photo frame. The whole project is based on the full color RGB led panel made by the Chinese company Linsn. It is composed by 1024 rgb led ordered in 32 rows of 32 leds each and mounted with a lot of logic on a black PCB 19x19 cm size. Everything in enclosed in a plastic frame with a set on placement for M3 screws to use for mounting. On the rear an Arietta G25 module is used to generate all the signals requested by the RGB panel starting from a 32x32 pixel graphic image. The Pyhton graphic library called Pillow is used to create the image starting from graphic primitives, true type fonts, and jpg, png, etc images. The WiFi capability of the Arietta G25 (also in Access Point mode) and the Python module for the networking, open a lot of possible uses of this project. Linux is loaded in few seconds from an 8GB microSD with more than 7.8 GB free !! Tons of softwares, tools, languages and libraries can be installed. Complete step by step guides are available on this site. 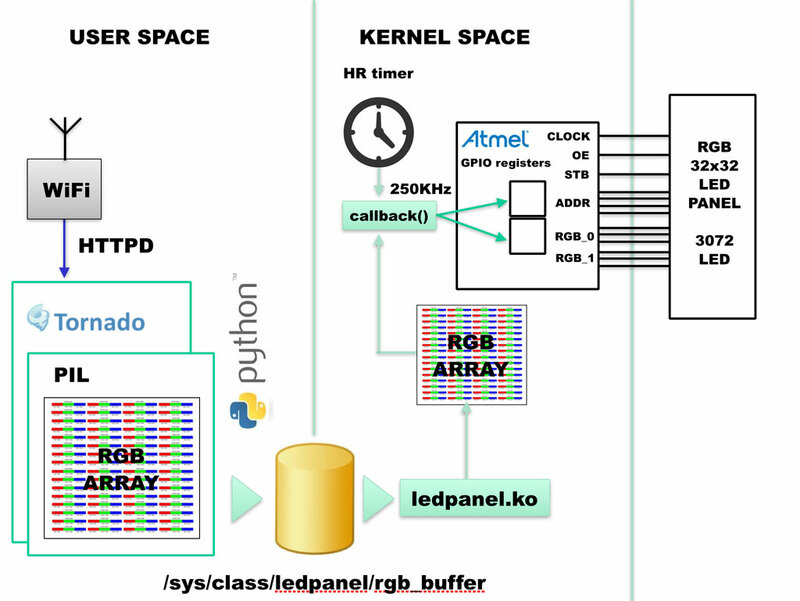 The RGB led panel has a two 16 pins male connector where to send data using a synchronous serial transmission. On the output data connector just replicates the input lines for a wire another RGB led panel display. The power supply connector needs 5 VDC @ max 3A. At this current all leds are on at maximum brightness. Here are some user space example to use our RGB panel led. All the examples are in Python and can be downloaded on your Arietta with a single git clone command. 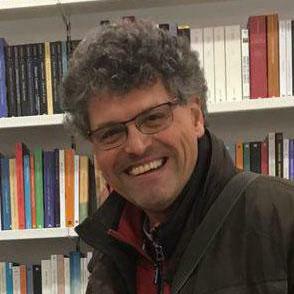 remote: Counting objects: ..., done. remote: Compressing objects: 100% (../..), done. Receiving objects: 100% ..., done. Resolving deltas: 100% ..., done. This is the list of utilities available. If you can't run something try to update your repository by typing: git pull. Let's see now how to convert an image to a byte array to be displayed on the led panel. With the keys  and  changes the brightness until the arrow color became equal t the original. Pressing the [s] key it is possible to save a screenshot of the image with the name "panel_xxxx.rgb" where xxxx is an incremental counter. The *.rgb file contains the raw byte array image at 3 bytes per color ready to be sent to /sys/class/ledpanel/rgb_buffer. 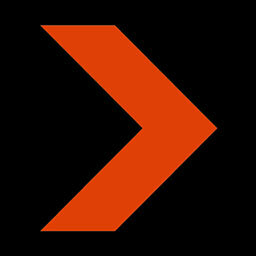 If you need to design a 32x32 icon from scratch you could use x-IconEditor. X-IconEditor is an on-line graphic editor to create favicon.ico icons for the web pages but you can download and convert the favicon.ico file generated with convert.py and display it on your panel. This example written in Python shows a count down from 99 to 0 using a full size TTF font. The RGB color and the message to display are given from the command line. This example shows the system time in HH:MM:SS format using a big TTF font and slide the line horizontaly. The RGB color is given from the command line. 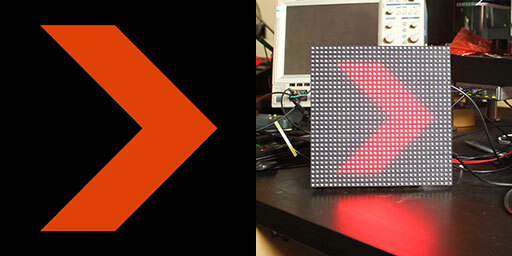 All the rgb led panel are generate in bit banging mode using normal GPIO lines. To go as fast as possible a Linux driver written in C code is required. The driver I wrote can update the whole panel contents 679 times per second leaving enough time to Linux to do other jobs in the meanwhile. The main routine of this driver is a callback function called by a hrtimer 10800 times per second at interval of 92uS. 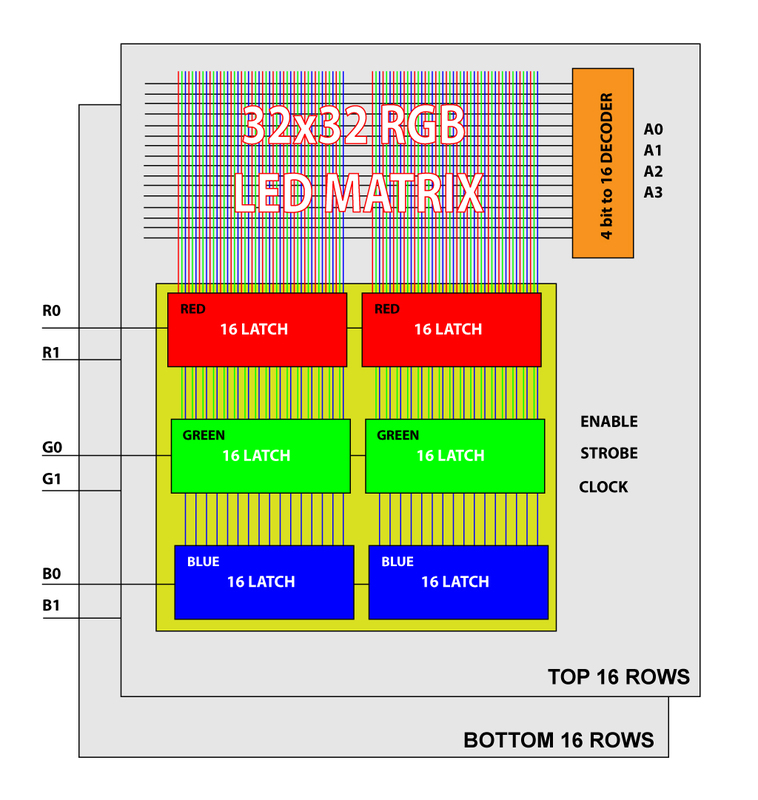 In just 22uS this routine check the brightness of each color and send a simulated pwm signal to any led (32 x 3 color = 96) on a single row then exit. It will be called again by the Kernel after 66uS. Now you can try some example to show something on the display.